When full time work with the tool is considered, every detail is important, that is why we want our tools to be simple to use, as light as possible, visually acceptable, in two words, user-friendly. Our improvement in ergonomic sense is reducing of tool handle opening which makes our products, compared to competitive tools, the tools with the smallest handle opening. 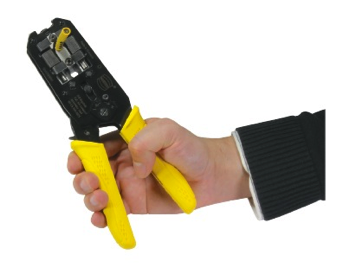 Keeping in mind that many times the tools are in the hands of female users which need one hand to hold the wire-connector assembly, the fact that they can crimp the connector holding the tool in the other, and not having to let of the assembly to crimp, is of great importance. Whenever it is possible we simplify the work of cable assembly, this is achieved by adding some features to the tools which our competitors do not offer. K787 tool for crimping of shielded plugs with wings (short body version), this tool provides simple 1-step crimping. This means that there is no need to bend the shield with bare fingers, but simply load the wire and insert the plug into the tool, and crimp it all at once. Our smoothly shaped ergonomic plastic handles fit optimally in the hand and prevent the sliding thanks to special material applied. He sound of the tool is of course something to take care about; this made us design and produce new ratchet mechanism. With its unique shape of contacting surfaces it has all the features of standard ratchet mechanism including the handy unblocking feature, but makes much lower noise than any of competitive products. Anyone should consider this when we talk, for example, about 50 users, each with his tool, closed in one space, 8 hours a day, that have to listen to the clickering noise of their tools. Fine division of ratchet mechanism gives a better control during the crimping process.